In the 2014 Certain Days calendar, political prisoner David Gilbert wrote that the “War on Crime” which began in the early 1970s was in fact a conscious government counterinsurgency strategy to decimate and disrupt Black and other people of color communities across the United States. Also a digital (kindle) version of this pamphlet is available from Amazon for 99¢ – click here to get it ! 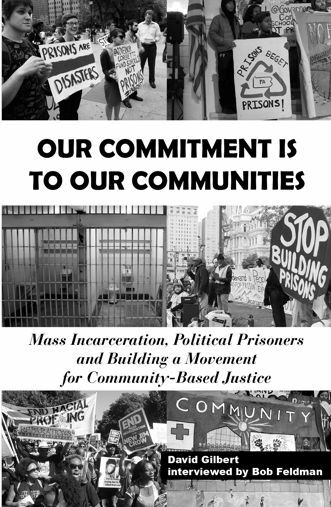 Our Commitment is to Our Communities is an important intervention in which David Gilbert, an anti-imperialist political prisoner since 1981, provides a refreshingly political analysis of the mass incarceration and mass movements for radical change. The goal is to get this pamphlet into the hands of as many people as possible, to spark discussion, and help strengthen our collective struggles. You can help by ordering copies (special prices for bulk orders) for your organization, reading group, bookstore, infoshop or community space. By downloading the ebook (available from Amazon here) and discussing it, reviewing it, just giving it a rating on Amazon. (It is free for the next five days, and only 99 cents after that.) Or simply by sharing this notice of publication, the press-sheet, or the associated facebook virtual pamphlet launch event page! Got other ideas, or questions? Contact the publisher (that’s me) at info@kersplebedeb.com! 2 Responses to "Our Commitment Is to Our Communities: David Gilbert Interviewed by Bob Feldman"